Belted swimsuits? Where have you been all our lives? The look that’s swept our Instagram feeds has to be the most flattering swimwear trend ever - and it’s one we’re hoping will never go away! 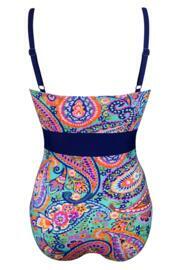 We’ve fully embraced the belted look here at Pour Moi with this gorgeous tummy control swimsuit from our Bohemia range. With a wide navy band to nip you in and create that gorgeous hourglass waist, you’ll make waves, even if you’re just sat by the pool. 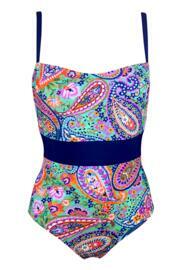 As if that’s not enough, the old-school glamour has been brought bang up-to-date with the popping paisley print. The straps are fully adjustable and there’s secret shelf support, too. In fact, what’s not to love?